Click underneath the SPOILER alert below to find out who won the competition to become the new Head of Household. Jeff keeps on sliding his way in at top speed and he’s leading the way. He does some choking on the bubbles though and Daniele brings him some water. It is like a foam hurricane going on in there. Next up to take a dive is Adam, who goes down hard but gets back up and keeps running at it. After a very long — and very wet — competition, it looks like the veterans have done it again. The newbies are left wet and pitiful as Jeff fills his globe first and wins Head of Household. 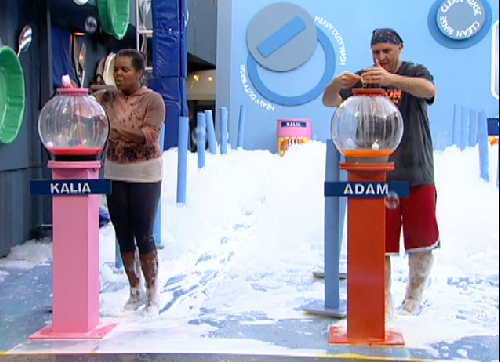 If you missed the Head of Household competition, you can use the Big Brother live feeds Flashback to roll back to 7:05PM BBT and catch all the fun. This competition really was quite entertaining. We especially loved all the scowls from Daniele. Well worth watching!